Charles Chapman Grafton (b. April 12, 1830 - d. August 30, 1912) was the second Bishop of the Diocese of Fond du Lac. Born in Boston, Massachusetts, he was a supporter of the Oxford Movement, an affiliation of High Church Anglicans that led to Anglo-Catholicism in The Episcopal Church. 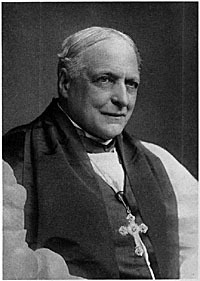 Prior to his election as bishop, Grafton was Rector of Church of the Advent in Boston. Grafton was consecrated on April 25, 1888 at St. Paul's Cathedral, Fond du Lac by William E. McLaren of Chicago, Alexander Burgess of Quincy, and George F. Seymour of Springfield. Grafton founded the Anglican religious order Sisterhood of the Holy Nativity and was a founding member of the Society of St. John the Evangelist. Further information on Bp. Grafton is available from Project Canterbury.